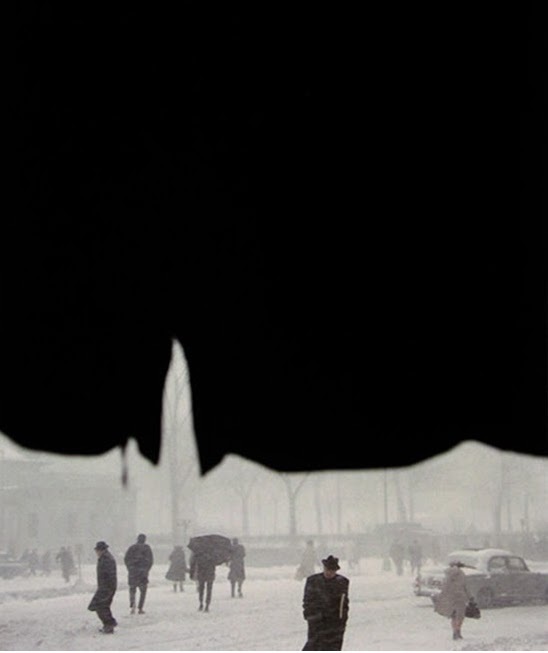 Photographer Saul Leiter (1923-2013) spent a large portion of his life living in New York City. Working in the tradition of the street photographer, he captured images from Manhattan, applying an artistic eye to a city that was in constant motion. The city, represented through light, composition, movement, shadow, and most of all color, was transformed through his lens. His work is, in many ways, a visual companion to E.B. White’s Here is New York. 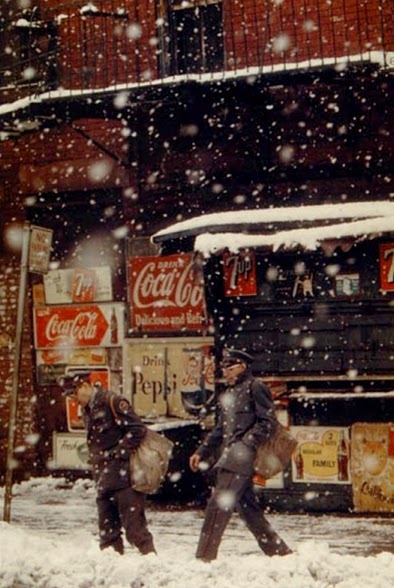 Leiter started shooting color in 1948, a moment when the American cultural landscape was shifting, its contours shaped by the world war and shaded by the new Atomic Age. Leiter enjoyed success in the newly burgeoning consumer market; he made money creating images to advertise products and ideals. In the late 1940s and 1950s, fashion would be elevated to an art form and American women were enticed by the promises for a better life. Purses! Hats! Shoes! Leiter’s commercial work was accompanied by a foray into the world of art photography. 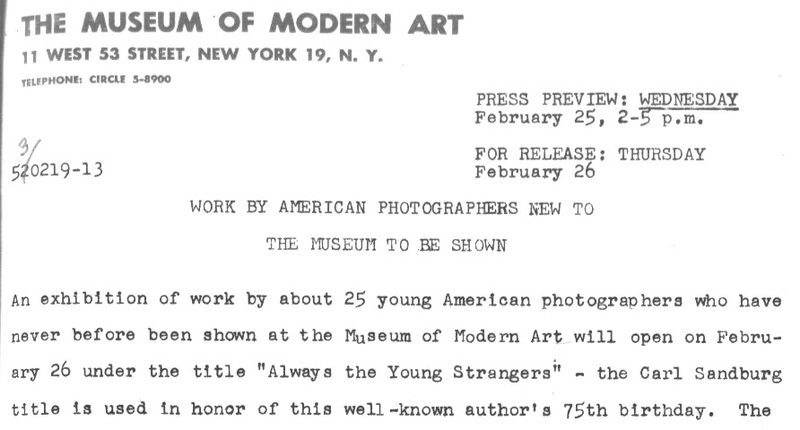 In 1953, Edward Steichen, curator of photography, selected Leiter to be included in an exhibit, “Always the Young Strangers,” at the Museum of Modern Art, along with 24 other “young American photographers.” The show’s title was taken from the title of poet and writer Carl Sandburg’s 1953 memoir. After the show, Leiter’s artistic success never quite came to fruition. 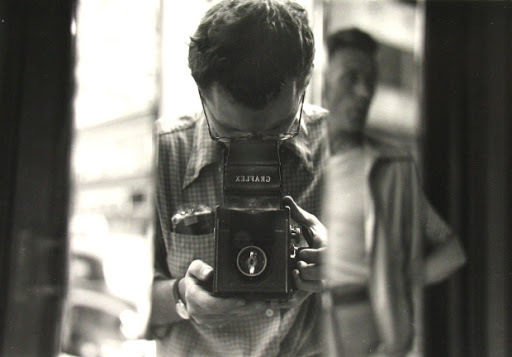 He continued to work in commercial photography, and to roam Manhattan’s streets, documenting the postwar city. 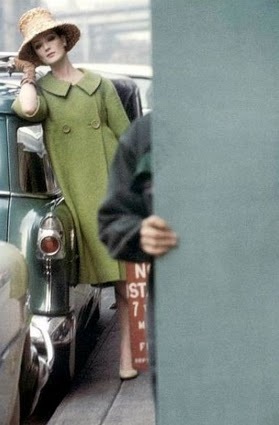 He made the unusual choice (for a street photographer at that time) to shoot in color. His images took on a striking theme: people alone in a vast concrete jungle. Indeed, his images seem to capture something about the pace of American life after the war: its hard driving focus on work and ladder-climbing; he sought color through his lens, but the suggested reality of life in the city had a black and white cast. Leiter stated that, as an erstwhile painter, he had been heavily influenced by painters such as Edgar Degas, and he sought to capture beauty through his images. But he also said, “There are the things that are out in the open and then there are the things that are hidden, and life has more to do, the real world has more to do with what is hidden, maybe.” An interesting comment from a photographer who goes out “in the open” to see. Perhaps he was seeking what was hidden. 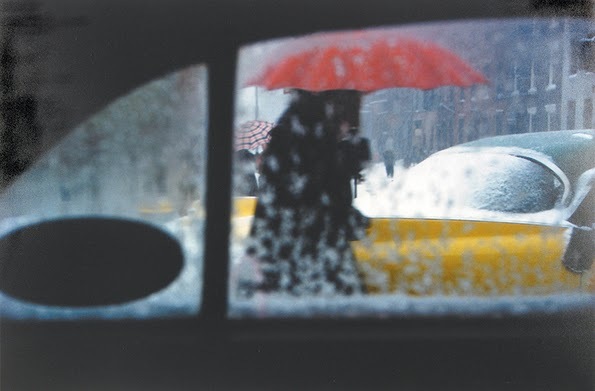 Leiter’s images picture New York in many layers: the camera’s presence is central to the finished piece; we view scraps and shreds and pieces of the city, buried beneath light, shadow, rain, snow. 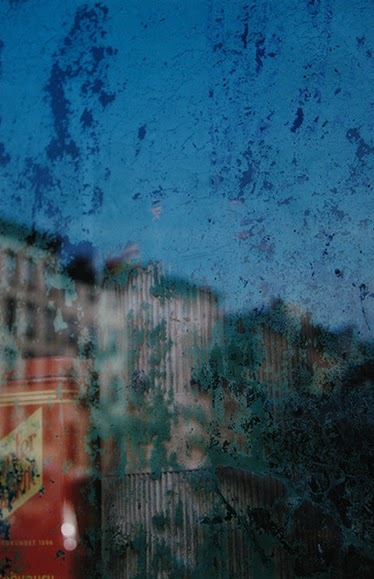 We can’t see a “decisive moment” in Leiter’s images, but we do glimpse something of the motion of a city that is constantly transforming itself. 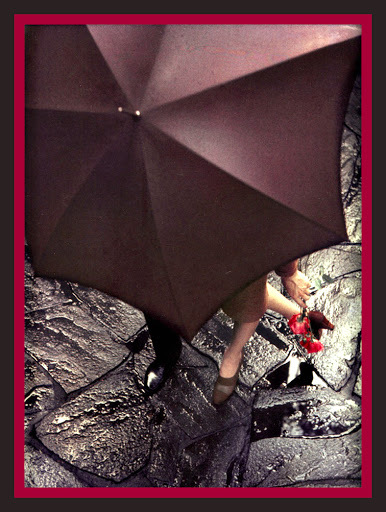 People come and go, walking, trudging, working, stopping for a moment; they are not easy on the city streets. 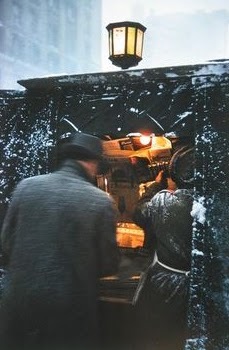 They are busy getting from here to there, caught up in the mad dash to make a living in the postwar city. 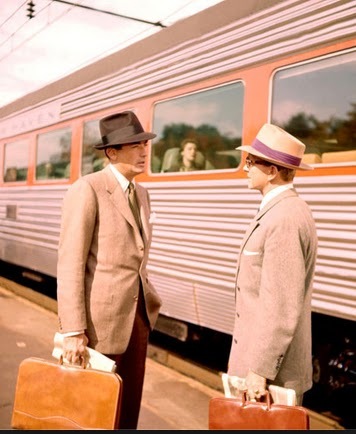 Engaged in the daily chore of getting from here to there, they reflect a modern, dizzying pace in America after WWII. 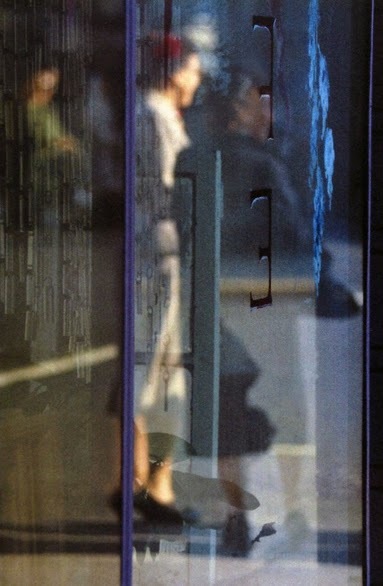 Leiter’s images can be paired with a certain trend in a host of artistic works that came out of the immediate postwar gloom; his images are at home with those depicting a sense of dislocation and anxiety in works such as Ann Petry’s The Street (1946), Carson McCullers’ The Member of the Wedding (1946), Arthur Miller’s Death of a Salesman (1949), and Sloan Wilson’s The Man in the Grey Flannel Suit (1955). His images are connected to the eerie sense of a cold, morally neutral world inhabited by characters in Raymond Chandler novels and reflected in film noir, a genre known for its literal black and white portrayal of a corrupt postwar world. 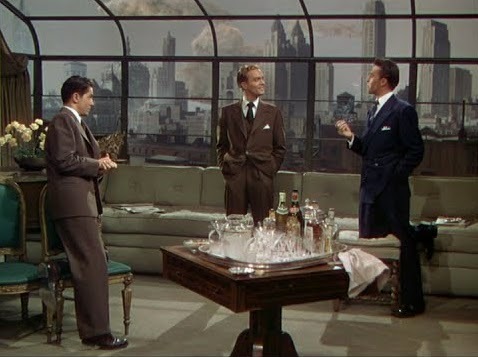 Leiter’s use of color was as unusual as the rare “color noir” film such as Leave Her to Heaven (1945) or Rope (1948). 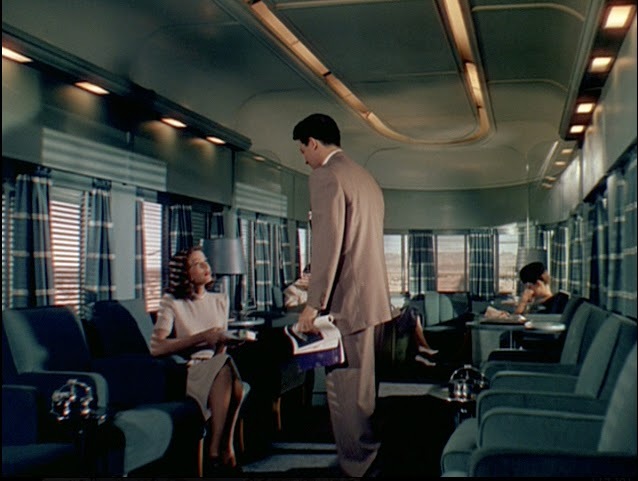 Often, the color of the fifties was portrayed in grand Cinemascope style. 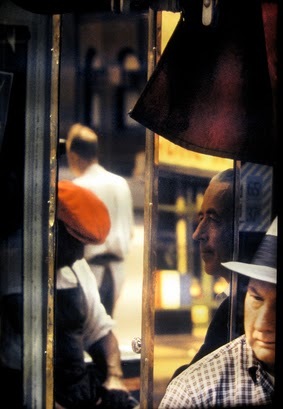 In Leiter’s work, color is deployed to frame the fragmentary moment. Even in his most colorful images, themes of loneliness and isolation emerge in the various surfaces of Leiter’s work; he depicts fragments of a world that seem captured from life, resembling stills from a film. Director Todd Haynes is known for turning to the work of early 20th century photographers in giving visual depth to his films. In Carol (2015), Haynes portrays a photographer in a film that is heavily inspired by photographers. 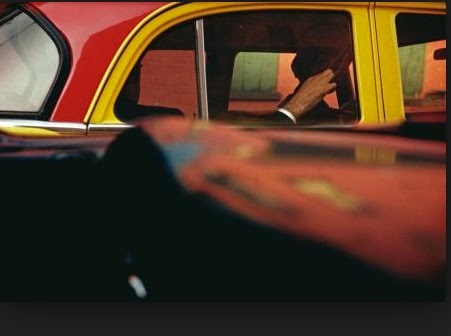 Along with looking at the work of photographers Helen Levitt and Vivian Meier, Haynes also turned to Leiter for inspiration. See cinematographer Edward Lachman’s comments about using Leiter as an inspiration in shooting the film. Leiter’s work offers viewers a chance to see New York City, and America, at a particular historic moment. His artistry is clearly visible in his images, and in working against the (film) grain, as it were, he brings out the color of the city. He shows its layers, its movement, and its people, all striving, working, seeming to push forward toward a future and its promises. 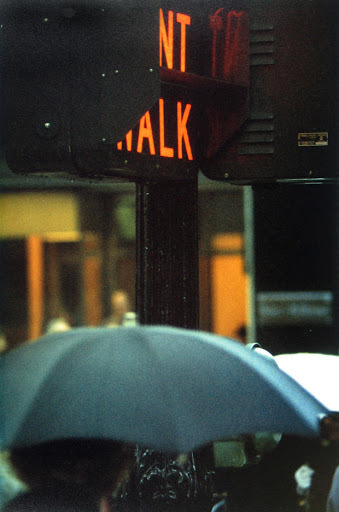 You can see Saul Leiter in conversation (2012) here. Jenny, another unique and insightful post! Thank you, Penny! And thank you for reading my blog!! What a fun read. I need to share this with an artist I know.